Night diving is done off the house reef from the residence of Selina and Harm. We dive just as darkness falls (1830- 1900Hrs). Dive time is 45- 60 min at a maximum depth of 12-15m, most of the dive being at 5-7m. It is an easy, relaxing, slow dive looking at strange and bizarre organisms that only come out at night. Now here is where you see creatures unfamiliar to humans! The resident lobsters would look much better dressed with butter garlic sauce! Watch the changing colours of octopus, squid and cuttlefish as they hunt. The normally shy moray eels, snake eels and puffer fish often come out to say hello. There are beautifully coloured side-gill slugs and flatworms interspersed with numerous Spanish dancers (look-out for the partner shrimps) and nudibranchs. This superb House Reef, home to juveniles, has specialities including guitar rays, Kuhl's rays and crocodile fish. 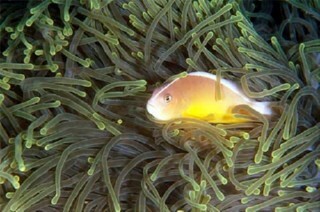 Occasionally wasp fish, dwarf lionfish and flying gurnard are seen. 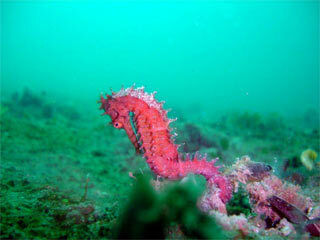 Watch out for the beautiful but shy sea horses and the even more elusive frog fish. All this can build up a good appetite and the dive ends just in time for dinner where ever it may be.